Carly and Sandy are happy to have a new friend join their games. But Lily Jean changes things. She decides they’ll play house, and she orders Carly to be the baby. When they play king and queen, she tells Carly to bark — King Lily Jean demands a royal dog! Carly is tired of being bossed around! 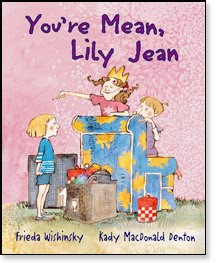 She comes up with a way to teach Lily Jean a lesson. With Sandy’s help, can she turn a bully into a friend? My children and I enjoyed reading this lovely book. It is a simple story but it shows a good friendship between two sisters, and how they deal with a third child who joins their playing. It's also a story that allows a parent to bring up the issue of bullying without it becoming a heavy subject. My kids both loved the way Carly outsmarted Lily Jean. My 5 year-old remarked that the book teaches that others won't want to play with us if we're rude, and that if a friend does not want to play the game we've chosen, we could make up another one. It's an age-appropriate tale with attractive watercolor illustrations suitable for this age group.